Thieves Spray to Go Please! 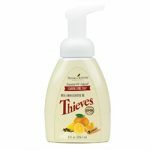 Thieves portable spray is a must. We are not always at home, and most of the time we come into contact with surfaces that are not clean. Thieves spray is small enough to take with you, and safe to use where ever you need it. 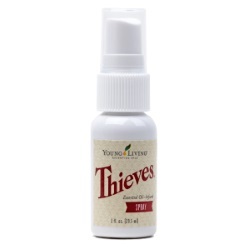 Safe to use around children and the perfect size to throw in a purse, backpack, or luggage, a bottle of Thieves Spray is ideal to keep with you wherever you go! Also, you may be interested in Thieves Foaming Hand Soap. I have this in my bathroom, and I love it. My hands feel so clean after using it. If I invited you to this page or you just happened upon this page and have questions or want more information, you can Email me at DexterDBlack@comcast.net or call me at 717-467-5088. If someone else invited you, please get back to the person who sent you here for further ordering or informational questions. This entry was posted in Essential Oil Infused Products and tagged all natural bathroom cleaner, natural cleaner, natural cleaner for work, natural spray cleaner for the office, portable cleaner, safe natural household cleaner, small spray cleaner, Thieves spray, YL Thieves, Young Living Thieves. Bookmark the permalink.